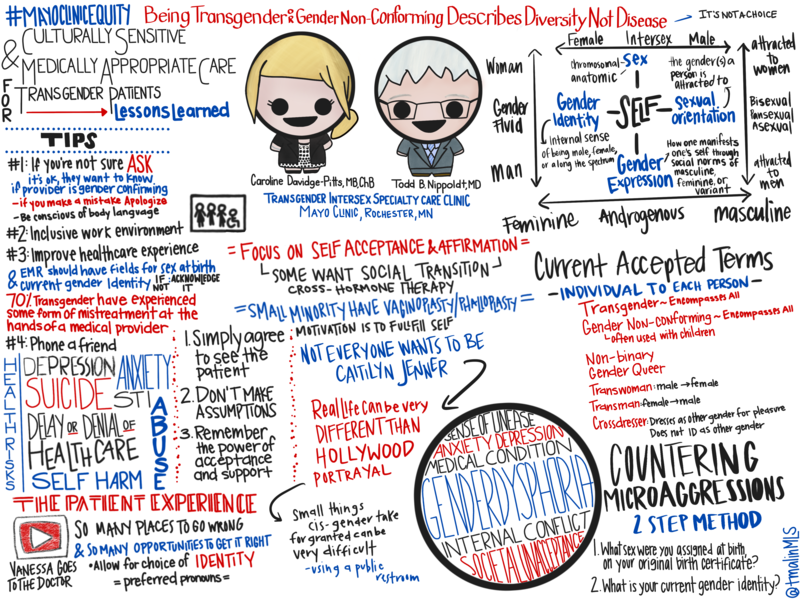 Caroline Davidge-Pitts, M.B., B.Ch., and Todd Nippoldt, M.D., share inclusive terminology and lessons learned from Mayo Clinic’s Transgender Intersex Specialty Care Clinic. Dr. Davidge-Pitts graduated from the University of the Witwatersrand Medical School in Johannesburg, South Africa, in 2004. Prior to coming to the U.S. in 2008, she worked in both South Africa and Australia in internal medicine and palliative care. She completed her internal medicine residency in 2011 at Mayo Clinic in Florida and an endocrinology fellowship at Mayo Clinic in Rochester in 2014. She is an Assistant Professor of Medicine in the Department of Endocrinology at Mayo Clinic and a core member of the Transgender and Intersex Specialty Care group with research interests in medical education related to transgender health care. Dr. Nippoldt is an endocrinologist at Mayo Clinic in Rochester. He joined the Mayo staff in 1988 and currently holds the academic rank of Associate Professor of Medicine. Dr. Nippoldt completed medical school and his internal medicine residency training at Mayo Medical School and Mayo Graduate School of Medicine, respectively. His endocrinology fellowship training was at the University of Michigan in Ann Arbor. During his career at Mayo, Dr. Nippoldt has served as chair of the Pituitary, Gonad, Adrenal Core Group and as vice chair for Practice for the Division of Endocrinology, among other leadership positions. Dr. Nippoldt developed an integrated multidisciplinary practice for the care of transgender and intersex patients and currently is Medical Director of the Transgender Intersex Specialty Care Clinic. He has received the Department of Medicine Laureate Award and was named Teacher of the Year in Endocrinology. A sketchnote is a graphic representation combined with text as a form of note-taking. It was coined by Mike Rhodes and also goes by graphic note-taking or graphic recording. The premise is to create a graphic record of an event that is engaging and informative. For the note-taker, it also serves as a tool to help with retention and recall of the information. By associating text and image (Dual Coding Theory), we help to create additional neural pathways to information, making it more accessible later on, and learning becomes more durable. Theresa Malin is an Education Specialist in Transfusion Medicine at Mayo Clinic. She is a faculty member of the Mayo Clinic School of Health Sciences and serves as an educator for a wide variety of medical students and clinicians from the Mayo Clinic School of Graduate Medical Education. She has worked as a Medical Lab Scientist in hospitals across the country and found her way back to Mayo Clinic in 2014. Outside of work, Theresa loves to explore the seemingly ordinary through the creative lenses of her three children.